"Hurricane-force" winds are tore through Northern Europe on Thursday, forcing road closures and stopping trains. Gusts reached 90 mph as police in Almere, 33km west of Amsterdam, urged people to stay home. Schools are closed in many countries and hundreds of thousands of people are currently without power, according to the Washington Post. Across social media, people weathering the storm are sharing videos of the wind taking bikes, destroying storefronts, and peeling roofs off buildings like a band-aid. The worst of the storm hit the Dutch coast, including Amsterdam where the city's Schiphol airport was closed. It's the world's 12th busiest airport, serving more than 63 million passengers in 2016. Flights were halted around 8am local time and slowly resumed a few hours later. At least 260 flights, predominantly to and from European destinations, were entirely canceled, the airport announced on Twitter. The videos being shared are dramatic, illustrating winds so strong they blew over a stack of shipping containers like a child toppling toy blocks. 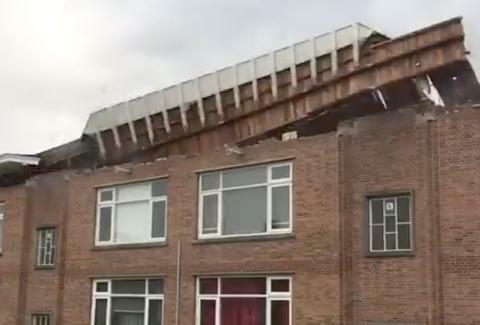 Elsewhere videos showed roofs being removed and people struggling to stand upright as the intense gusts tore through the streets. The storm's impact has been felt from Scotland to Germany with three deaths reported in the Netherlands and Belgium and the UK experiencing widespread power outages in the southwest.